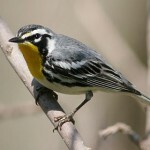 Description: Male is dark olive above; broad black eye mask bordered above by white; eye mask bordered below by bright yellow throat and breast; yellow underparts. Female duller overall and lacks black eye mask; has whitish eye ring. 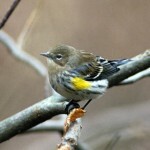 Immature similar to female, but browner overall. Behavior: To keep predators from spotting the nest, parents secretly approach the nest in thick grass and depart by another route. Habitat: Found near moist or aquatic sites, especially tall grasses, emergent vegetation, and shrubs or trees along shorelines. 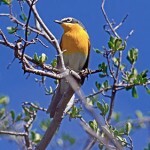 Sometimes occurs in upland shrub thickets, retired croplands, and weedy residential areas. 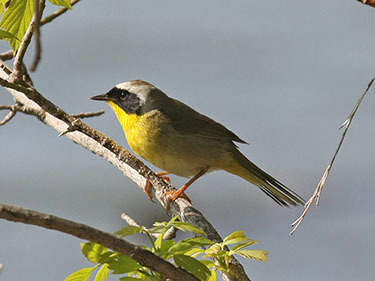 Fun Facts: The male Common Yellowthroat performs a special flight song, given as he rises high into the air on fluttering wings. When choosing a mate, females appear to prefer males with larger masks.